It was a sunny day sweeping the clouds away. We were on our way to ride the Sky Splash at Sesame Place. It was my eight year old niece and two year old daughter’s first time getting on this ride, and they enjoyed it so much that they wanted to get on a second time. After patiently waiting in line again this past Wednesday, August 18, it was our turn to get on the ride. My little girl, who made the height requirement for the ride by a smidgen, eagerly helped me to put on her life vest then told both me and my niece, “We hold on tight!” (I was impressed that she remembered what to do). We smiled as the life guard pushed our raft to help it propel down the slide, but within a matter of seconds we came to an unanticipated halt; something major went wrong. The expressions on the faces of the workers along the slide check points revealed that they were nervous and concerned but had no idea what was going on. About five minutes later, the nearest lifeguard yelled out that the water jets were not pumping out to push the raft down the slide because they had lost power. This ride, in particular, has a series of huge slides and is up high in the air, so we were stuck. What truly impressed me was how well both my niece and daughter handled this ordeal. We even joked about how at least were not stuck on a roller coaster. Without me asking, my niece started singing the alphabet song with Quinn, probably so that she would not be nervous. Actually, both Mackenzie and Quinn were not only patient but calm and did such a wonderful job following directions. Initially, two life guards attempted to push and guide our raft to safety down the slide, but it would barely budge and was high risk. After being stationary for about fifteen minutes with several onlookers watching us from below, we were informed that the entire park had lost electricity, and they were uncertain when it would be restored since an occurrence like this rarely occurs. Then, about ten minutes later, a gentleman came walking down the slide. He was very apologetic about the incident and informed us that he would be guiding us up the slide and back to safety. I tightly held on to Quinn as we climbed up the slippery slide being careful not to fall or lose my balance as Mackenzie held the hand of our guide. No one cried, indicated that they were scared or complained about the inconvenience of the ride not working. My niece and daughter were so brave. I am amazed at how mature the both of them are becoming and so grateful that we all made it off of the slide without incident. Though the power was off for approximately two hours, my niece and daughter both went the flow, and we still managed to have a nice and sunny day at Sesame Place. P.S. We plan on going back tomorrow so that we can have our last summer hurrah before it’s time to go back to school and work. Wish us luck that everything is operational and that we have an even better time. 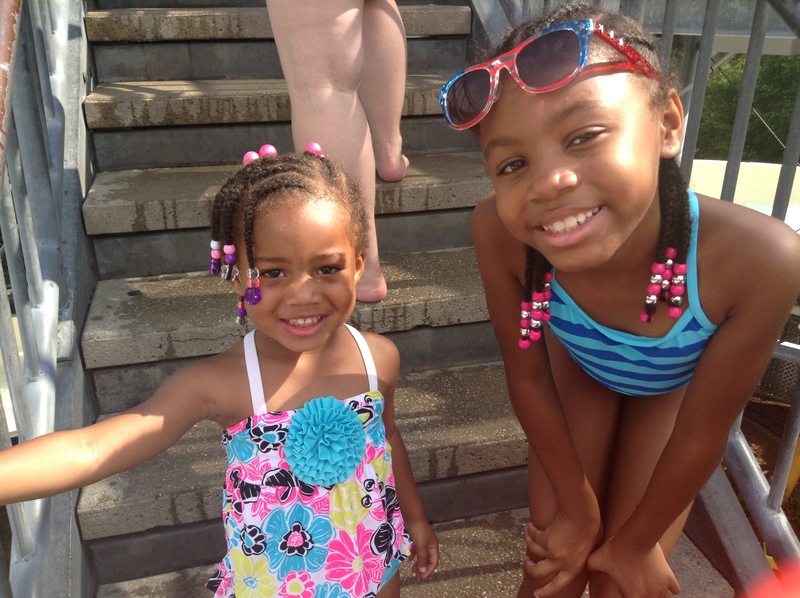 This entry was posted in Baby Musings and tagged Amusement Park Ride Malfunction, Brave Children, Brave Toddler, Sesame Place, Sky Splash, Sky Splash at Sesame Place, Tanya Franklin, Tanya H. Franklin, Tanya Harris Franklin. Bookmark the permalink. ← Park it Right There! My Toddler Rules the Playground!